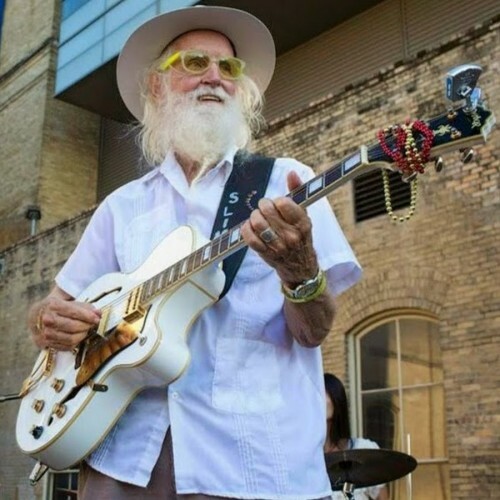 Texas musician Slim Richey died on Sunday. He fronted the jazz band the Jitterbug Vipers and played the festival folk circuit. With a flowing white beard and glittery sunglasses, he played roots, country, and his favorite – swing jazz. Slim Richey had been coming to gig regularly in West Texas since 1992. He lived in Austin but grew up in East Texas, as he told our radio host John Jennings in 2009. Without lot of people around that knew anything about what I was interested in. So I just started playing guitar and got into swing band in school. He returned to our studios in 2013 shortly after he was badly injured in a hit-and-run accident, as his wife Francine Meauxjeaux told our host J.P. Schwartz. After he got run over and fixed up. He was in the hospital and the first thing he did when he came home was to pick up this little guitar that was sitting there. Just to see if he could play. Then he went to bed. My hands were pretty cut up pretty bad and really sore, so I didn’t know what I could do. A skilled guitarist he traced everything back to jazz. It might not be jazz, in a way, but everything we do is informed by jazz. I used to play with Wayne the Train (Hancock), but I played just to a different set of chords. A little bit different feel. That’s what Bob Wills played; it was jazz. Richey passed away after contracting lymphoma. He was 77.